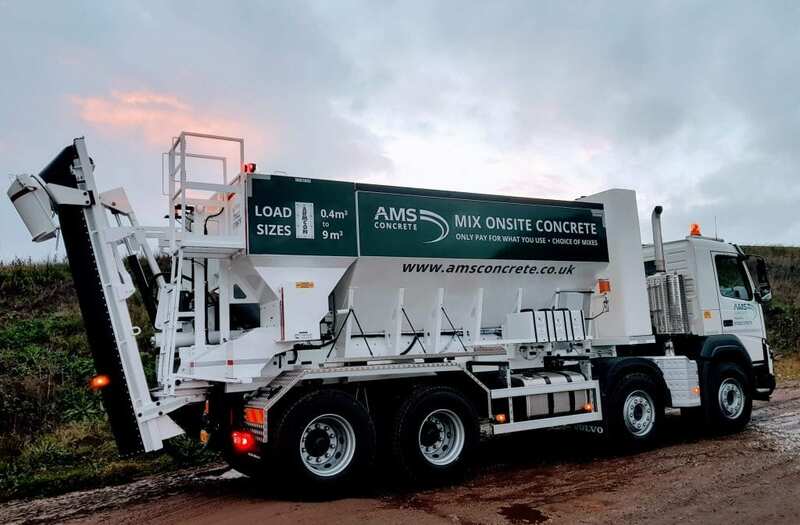 Avon Material Supplies now offer volumetric concrete mixer trucks, for onsite concrete orders, to complement the ready mixed concrete services currently offered through AMS Nationwide. Our volumetric trucks enable concrete to be mixed ‘live’ at the site, which has advantages for many construction projects, compared with the traditional barrel delivery method. With concrete orders dispatched using barrel trucks, batches are ready mixed at the plant and then delivered to site ready to use, which is OK assuming the volume ordered is spot on and won’t result is under ordering, wastage or part load charges. With the recent launch of our volumetric mixer service, we thought that it would be helpful to take a look at the important advantages of both mixing methods for different jobs. In this article, we highlight the benefits of each system, to help you better understand whether ready mix or volumetric mixed concrete is best for your needs. Speed – ready mix concrete delivered in barrel trucks is a good choice when time is super critical, as the material can be dispatched instantly upon arrival. Consistent quality – as ready mix concrete is prepared in advance at the plant, rather than onsite as is the case with volumetric, there is less scope for an inconsistent mix to be produced. However, a properly trained operative (as supplied by AMS) will ensure that volumetric mixing is also conducted to the highest standards at-site, to produce a consistently high-quality concrete mix. Time-limited – depending on the mix, you may only have a couple of hours to use the concrete from the time the batch is mixed at the plant. Cost to return – if unused concrete needs to be returned for disposal this will almost always incur additional costs to the user. Only one mix per batch – you only receive the same mix as was loaded. Requires an accurate estimation to order – as the concrete is mixed in advance, precise ordering is required to ensure you only receive the right amount of concrete for the job. Cannot change the mix design onsite – once batched, the concrete must be dispatched in a ‘as is’ state, which means on-the-spot changes, such as adding additives, is not possible. Onsite concrete mixing – offers the user the ability to adapt the mix and also ensures the volume of dispatched concrete is correct for its intended application. No waste – only the concrete that’s needed is mixed, eliminating the potential for waste materials. Larger mixing capacity – volumetric mixers can typically store double the volume of concrete compared with drum mixers. No time limit – with ready mix, there is a time frame within which the concrete needs to be used between mixing at the plant and arriving onsite. Volumetric mixers have no such limitations. Ideal for larger projects – onsite mixing means that the volume mixed can easily be scaled up or down, depending on requirements. Volumetric mixers hold up to twice the volume than traditional drum mixers, which is ideal for large-scale projects. Requires space onsite for the truck – concrete mixing trucks are fairly large plant vehicles, which obviously need some room onsite to park up and conduct the mixing. Overall, volumetric mixers have many benefits and advantages over barrel mixing for most typical commercial and domestic applications. Avon Material Supplies are leading suppliers of ready mix concrete and volumetric concrete mixer trucks to businesses, construction sites and domestic users in Poole, Bournemouth and the BH postcode area. To learn more about our concrete services, please contact our expert team online or call us on 01202 579579.